We have been trying to add more essential oils to our home in order to boost our immune system, and cut back on harmful chemicals. Frankly, I am getting sick way too often these days, so I needed to start thinking about how to avoid getting sick, and that really winds down to boosting my immune system and keeping things cleaner. For the South back to school has already started, but here in the Pacific Northwest kids do not go back for a few more weeks. As we near the back to school season I wanted to take some steps to ensure my family does not get sick as much. I recently found Mrs. Meyers Household Cleaners to be highly effective in cleaning while leaving my home smelling fresh. Mrs. Meyers products obviously won’t be able to help me in the cooking department but they work excellent in keeping the kitchen clean so I can cook healthier meals to boost my immune system, and while doing that these products leave behind a pleasant scent that lingers for weeks. I absolutely adore these products, and even though the company sent a nice sized assortment for me to try, I have been replacing them as they run out since I use them so often. 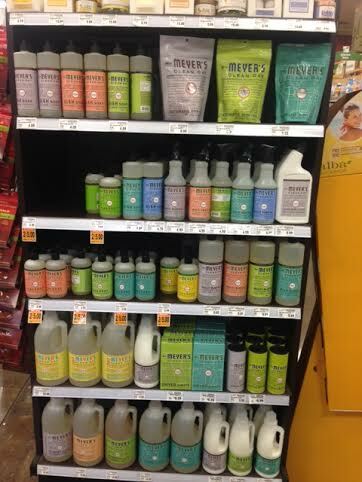 Mrs. Meyer’s clean day household products have a variety of different cleaners and soaps that leave cleaning and taking care of your house easy all while being eco-friendly. Moms don’t have to worry about harsh chemicals penetrating surface areas of their home, or the dishware they wash after dinner. The products are specially made for those who are sensitive to the harmful chemicals and acids used by non eco-friendly products. Since I am trying to cut down on using harsh chemicals I thought I would give these eco-friendly products a try, and I have to say I am really impressed. They work amazingly well, and seem to be dual purpose. As an example, I actually use the dish soap in my dish washing machine, and it works just fine. I use the laundry detergent in my carpet machine to clean heavy traffic areas, and it picks the dirt right up. I even use the surface cleaner to spot clean the carpet when my little dog has an accident. I do however, use a urine remover since these products are not specifically made for this use, but the surface cleaner leaves behind a more pleasant smell and does take the stain out. If you are also trying to cut down on chemical use then Mrs. Meyers Household Cleaners are a great fit for this. The products are also Phosphate-free, which is another advantage because Phosphates are harmful to the environment and your health. Apart from that the company also claims that they do not test on animals, a definite advantage over cleaning products that do. The Mrs. Meyer’s Clean Day Household Products offer several scents of dish soap, so you are able to rotate when scents get boring. I love that these products are offered in so many scents, and because they are chemical free you won’t have to worry about harsh residue being left on dishes that eventually land on food. The Mrs. Meyer’s dish soaps are said to be the best because of the use of fresh natural ingredients which are not harmful to anything or anyone. The scents offered right now include basil, apple cider, mums, red clover, lavender, lemon verbena, geranium, rosemary, bluebell, and honey suckle. They do come out with seasonal scents that are available for limited times during the holidays, so be on the lookout for those soon. The Mrs. Meyer’s clean day household multi-surface cleaners are made with the help of extracts from vegetables which help in a cleaner surface job. Aside from all of their products being made in the USA, I love the multi surface cleaner because it cleans just as good as harsh chemicals but its safer. In fact, before using these products my surface cleaner of choice was Lysol wipes and Meyer’s products actually get stains out of my counter tops that the wipes could never touch. These multi surface cleaners come in several scents including basil, apple cider, mums, red clover, lavender, lemon verbena, geranium, rosemary, bluebell, honey suckle. The window cleaners are made from the same ingredients as multi-surface but they are specially formatted to be used on windows. The scents offered are: Lavender and Lemon verbena. The acids in the regular tub and tile cleaners are replaced by natural oils in Mrs. Meyer’s tub and tile cleaners but they work better because oils naturally break up grime and particles that are found tile and porcelain. The laundry soaps are also made of natural oils and do not contain any phosphate to keep you healthier. They recently came out with HE concentrated that is compatible with HE machines. These are sold in 64 and 68 load bottles. You are able to purchase a 3 piece set – laundry soap, fabric softener, and laundry sheets for $29.99 and when you spend $30 or more on their website its also free shipping.